ATLANTA, Georgia, March 7, 2012 (ENS) – Philanthropist, environmentalist and CNN founder Ted Turner tonight announced his contribution of $1 million to the Atlanta-based Dian Fossey Gorilla Fund International, which works to save endangered gorillas in Rwanda and eastern Congo. At a special event at the Fernbank Museum of Natural History in Atlanta tonight, Turner also issued a challenge, urging others to open their hearts – and their bank accounts – and also support the Dian Fossey Gorilla Fund. In announcing his donation tonight, Turner expressed pride that the Fossey Fund is based at Zoo Atlanta in his hometown, and praised the work the organization does in Africa through the Karisoke Research Center in Rwanda, founded by Fossey in 1967. The Fossey Fund’s work in Rwanda has resulted in the mountain gorilla being the only ape species whose numbers are increasing. But gorillas in Congo have received little protection and their numbers are plummeting. “I’ve been involved in the environmental movement for a long time. And working to protect these wonderful creatures is part of that equation,” Turner said tonight. “We may live on the opposite side of the planet from Africa, but what happens there can and will affect what happens here – and all around our fragile planet,” Turner said. The Karisoke Research Center currently employs more than 100 staff members. 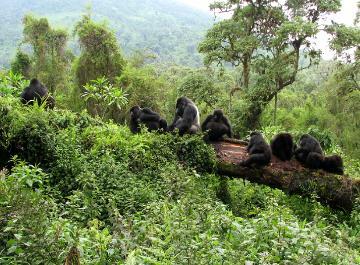 Over half are involved in research, protection and monitoring of the gorillas. Others are engaged in biodiversity and socioeconomic research, education, health, and administration activities. The Dian Fossey Gorilla Fund International is dedicated to the conservation and protection of gorillas and their habitats in Africa. Founded by Fossey as the Digit Fund and renamed after her death, the Fossey Fund operates the Karisoke Research Center in Rwanda, and maintains a staff of scientists, trackers and anti-poaching patrols in Volcanoes National Park. The Fund also works with community-managed reserves and national parks in the Democratic Republic of Congo, and operates extensive education, health and other community outreach programs.